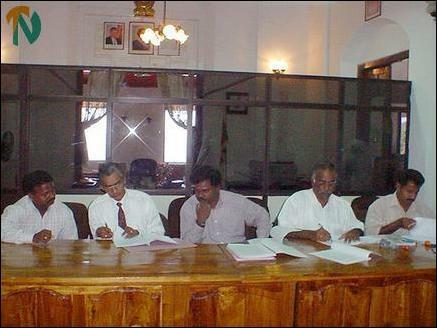 Trincomalee Government Agent Mr.Gamini Rodrigo (L) and TRO Trincomalee director Mr.K.Mathavaraja (R) exchange documents after signing the Kanniya village rehabilitation project agreement while NECORD Trincomalee deputy project director Mr.R.Umakanthan looks on. TRO is the implementing agency of this project. The implementation period of the project is one year. On behalf of the NECORD, its Trincomalee District Deputy Project Director Mr. R.Umakanthan, on behalf of the Sri Lankan Government its Trincomalee Government Agent Mr. Gamini Rodrigo, and TRO's Trincomalee District Director Mr.Mathavarajah, signed the agreement at an event held in the Trincomalee district secretariat, TRO sources said. Under the Village Rehabilitation Project (VRP), a pre-school, multi-purpose co-operative building, wells and ten rural roads would be constructed. Skilled development training in carpentry, masonry and other vocations will be given to twenty villagers. 69 persons would be provided with credit facilities to launch income generation activities, TRO sources said. Upto 1985 the Kanniya village was under the administration of one village level officer (Grama Sevaka Officer), which included the villages of Mankaiyootu and Peeliyadi, extending to 17.6 sq.km of land area. After 1985, under the reorganization of village level administration, the villages of Kanniya, Mankaiyootu and Peeliyadi were divided into three Grama Sevaka divisions. The extent of Kanniya GS division is 04 sq.km. and 95 percent of the population are Tamils and the rest Muslims and Sinhalese. Most of the villagers were agricultural labourers. Some were engaged in home gardening, cattle rearing and brick making. Consequent to the ethnic violence in 1983 and 1985, the village was completely destroyed and the total population fled, seeking refuge in Wanni and South India. Those who have now returned to resettle in their village are languishing without basic life supporting opportunities, said the TRO in its project report. Of the total population of about 300 families, 177 have returned upto now to resettle in their lands and all the families are Tamils, sources said.
" It is obvious that the economy of this village has been shattered due to the two decade old war. About ninety percent of the villagers are below the poverty line. They have not received any benefit from the current ceasefire which is in operation for more than two years," said the project report. 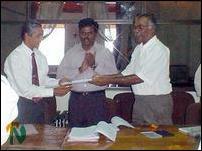 Trinco Government Mr.Gamini Rodrigo ( L ) and TRO Trincomalee director Mr.Mathavarajah ( R )sign agreement. ( L-R) NECORD Community sevice officer Mr.Chandrakumar, Mr.Rodrigo, Mr.Umakanthan ( NECORD ), Mr.Mathavarajah ( TRO) and TRO project director Mr.Kalaivarnan.